Samsung Electronics Co Ltd launched its first OLED TV on Thursday, taking the ultra-thin technology into a nascent market despite tenacious production challenges that keep costs high while prevailing LCD screens only get better and cheaper. The world's biggest TV manufacturer has staked its display future on OLED - organic light emitting diode - technology and its success with smaller screens has bolstered its smartphone market share and earnings. But big screens are likely to take a much slower road to profits. OLED technology is widely believed to offer the potential for better picture quality than standard liquid crystal display screens, with crisper picture resolution, faster response times and high-contrast images. It also allows for curved televisions, which manufacturers say offer a more immersive experience. But production constraints are a key problem. Samsung is producing OLED screens for TVs from a small pilot line and some analysts estimate the yield at just 30 percent - with seven out of 10 screens from the line faulty, largely due to difficulties in spreading organic light emitting materials evenly across large screens. Although many industry experts believe OLED will eventually be the next big thing, they do not think it will manage to do to LCDs what LCDs did to bulky cathode ray tube sets: almost completely replace them in the space of just several years. "They are not sufficiently transformational to trigger a complete switch-over from LCDs," said Eo Kyu-jin, an analyst at IBK Securities, adding that for now OLED televisons would represent less than 1 per cent of the 200 million-plus global TV market. Inc, some five times more than popular LCD equivalents. Samsung itself took a cautious tone, warning that industry forecasts for sales growth were a bit too optimistic. "We have just introduced our first OLED TV and have to see consumer response to gauge overall market demand," Kim Hyunsuk, a Samsung executive vice president, told reporters. Research firm DisplaySearch has forecast global industry-wide sales of OLED televisions at 50,000 this year and 600,000 next year, with rapid growth thereafter to reach 7 million in 2016. LG, which currently offers both curved and non-curved 55-inch screens, is estimated to have only sold a few hundred screens so far after starting sales earlier this year. LCD technology is also getting better and this is where many of Samsung's and LG's rivals, which lack their South Korean rivals' deep pockets, are concentrating their efforts. "OLED demand is likely to pick up strongly only after 2015. It has a long way to go to improve picture quality to the level of ultra-high definition and to lower production costs sharply," said Chung Won-suk, an analyst at HI Investment & Securities. Samsung, seeking to avoid putting all its eggs in one basket, also unveiled on Thursday 55-inch and 65-inch ultra-high definition (UHD) TV sets which offer crisper LCD picture resolution. Sony Corp and Chinese manufacturers are aggressively marketing that technology. As market dynamics remain uncertain, manufacturers' investment plans have so far been modest. LG Display, which is also working from a pilot line, has just started investing 706 billion won this year in large OLED panels. Samsung Display has yet to announce its capital investment plan for production of large OLED screens. 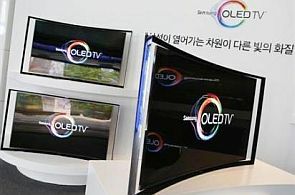 Samsung said it will begin selling its curved OLED televisions outside South Korea from July but did not specify which countries. It has no plans to offer non-curved OLED screens this year.